My name is Andrea, I took early retirement from the NHS after nearly 40 years in order to pursue my dream of opening a luxury cattery, one that I would be happy to leave my cats in. A lifelong cat owner, I currently have 6, Max, Lola, Milly, George, Missy and Harry. 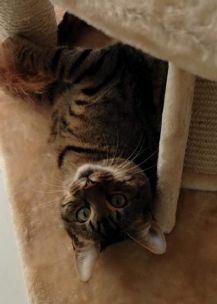 Sid, an abandoned cat turned up at the back door in 2017 and has now become part of the family. 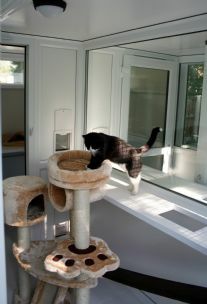 Cats @ Ratcliffe is a cat only facility.The suites are named after my cats that have now sadly passed over the rainbow. Harvey, Sophie, Archie, Oscar, Dylan, Jasper and the isolation suite, Toby. They were made and constructed by Peticular Pens, a specialist company based in Suffolk. They are constructed of the highest quality UPVc frames. Quadruple glazed, each suite is heated by individually temperature controlled units. 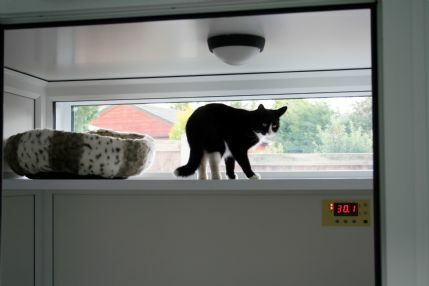 This means your cat is kept at a constant comfortable temperature at all times, never too hot or too cold. Full height sneeze barriers separate the suites. 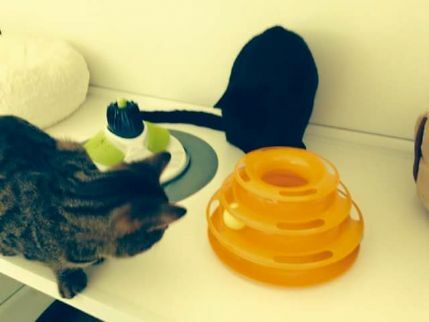 Opaque privacy screening is available for the more stressed cat, but observational experience suggest that cats are happy to watch what everyone around them is doing, including other cats. The suites meet the Defra Animal Welfare (Licensing of Activities involving Animals) (England) Regulations 2018. They are self-extinguishing in the highly unlikely event of a fire and very secure. There are 4 double suites, including lift out panels in the double pens to increase to Super-size if required. 1 Quad size, catering for up to 4 cats from the same household and 1 Super-sized, taking a maximum of 6 cats from the same household. 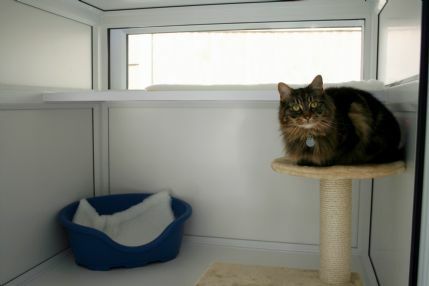 They also benefit from 2 cat-flaps offering a choice of levels to gain entry to the sleeping quarters, (the super-size contains 4 cat-flaps) which contain 2 sleeping shelves and an upper shelf with private window. 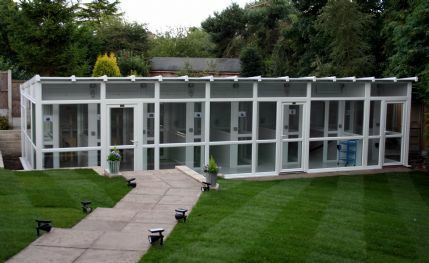 A further isolation pen is to be provided with a standard full height double glazed sneeze barrier and further glazed sneeze protection to the corridor and door lower with the door upper panel remaining mesh for airflow. Removable panels in the corridor allow even more fresh air in the summer months. 24 hour CCTV provides extra security. The exercise area is semi outdoors, the upper half of the front being mesh. Ramps in each suite provides easy access to the upper level of the exercise area. 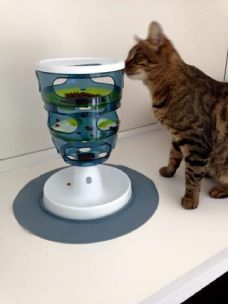 A cat tree and selection of interactive toys are available for the cats enjoyment and entertainment, while a range of differing beds are available for the more relaxed times. Hidey holes/sacks are available for the more timid/shy cats. You are also welcome to bring along any special toys, blankets etc. they especially use. General grooming is also part of the daily routine, Pet Remedy or Feliway room atomisers are used to de-stress our guests. Food is prepared in a separate kitchen under strict hygienic conditions. All the cats are fed a high quality range of food, both wet and dry food. The guests have the same diet that they are fed at home alongside extra daily treats of fresh meat and fish and of course Dreamies etc. It’s their holiday too. 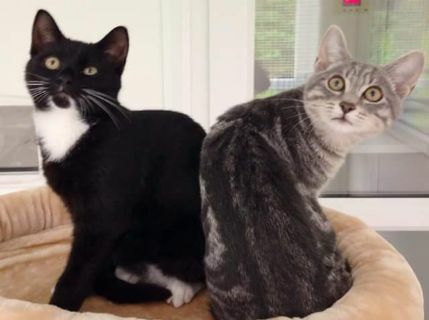 We do not accept male cats over 6 months (or over 2 kgs) that have NOT been neutered. No cat will be accepted if deemed unwell or showing signs of illness on arrival and we reserve the right to refuse admission to the cattery. All guest must be fully vaccinated and treated for fleas and wormed before they are admitted, an up to date vaccination certificate must be produced and will be kept for the duration of their stay. 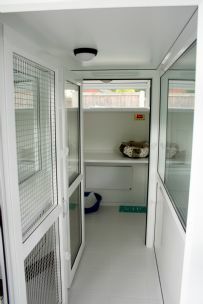 We cater for all cats and welcome oldies, kittens, diabetic or asthmatic cats etc. Special diets and medication will be given at no extra charge. Tariff starts from £13 per day. Minimum charge payable is £39. 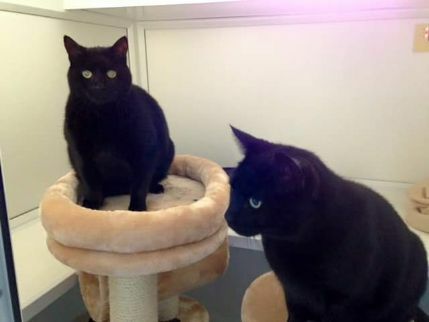 £25 per cat non refundable deposit is required in advance. Payment can be via cheque, cash Paypal or electronic bank transfer, payable on or before arrival. During the Christmas period (23rd December to 2nd January) the minimum charge will be £52. Gentle daily grooming is given if your cat will allows it. Nail clipping and Furminator Groom are charged at £5 extra. Excellent 5 star service. We felt guilty leaving our boy over Christmas but Andrea more than made up for the fact we were away . Spotlessly clean and enriching environment. When we went to collect I really liked the fact our boy seemed so pleased to see Andrea when she went into his pen and Andrea has got to know him and his ways so well . Love the daily photos and updates .its never easy to leave them but if you have to this is the place . Boarders Response:Thank you Janet for your fabulous review, I really appreciate it. I love having Toby to stay, he’s such a gorgeous character. I look forward to seeing you all again soon. 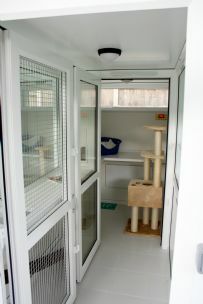 Lovely cattery - every effort was made to help my cat settle in. She was very well looked after. Boarders Response:Thank you for your review, I appreciate it and loved having Abbie to stay. Can't praise Andrea and her Cat Hotel enough. It was Amy & Loki's third visit and there will be many more. They have been so well cared for and I really appreciate the photo's being posted on Facebook, it was reassuring to see their little faces everyday. Thank you Andrea for looking after Coco for a second time. She is far happier being with you than she has ever been in other catteries. It makes such a difference to be able to go away and have peace of mind. See you in 3weeks time. Highly recommended. Our kitty cat Sansa has just come home from her first short stay with Andrea and I wouldn't hesitate to recommend her cattery and her fantastic personal, caring and accommodating service to everyone. Truly first class accommodation for the cats, I've stayed in hotels with less comfort features! 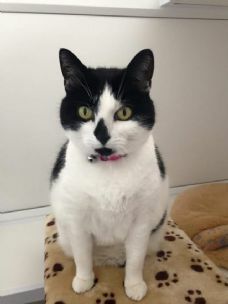 I really enjoy seeing the photos and reading the updates about how she has settled in and seeing all her cattery friends ðŸ‘ðŸ». Sansa will be returning very soon for a longer stay and it goes without saying she will be a regular. We can't thank you enough Andrea! I am very happy to recommend this wonderful Cat Hotel. This is the first visit for my elderly girl and she has been so well looked after by Andrea. It is such a relief to find somewhere you can trust. Thank you Andrea. 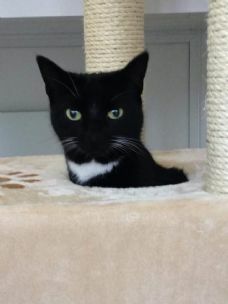 We would like to say a big thank you to Andrea for taking care of our cat Lucy, Andrea has a beautiful cat hotel Lucy has been three times now and is alway's very well looked after. We would recommend Andrea's cat hotel every time. Sent to me via email. We just wanted to pass our thanks on to Andrea for the loving care she took of our cat during a recent four day stay. 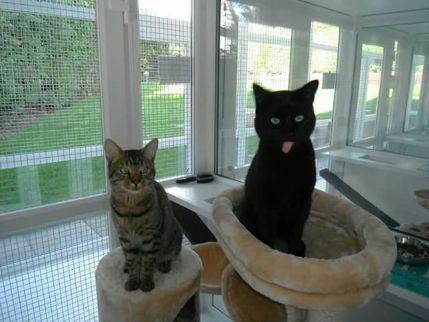 Cats @ Ratcliffe is a very professionally run and spotlessly clean cattery. 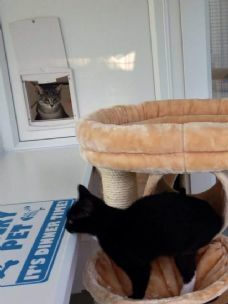 The facilities are also calm and relaxed - which is what we wanted for our nine month old cat who was being left for the first time. Its obvious Andrea is very fond of cats, and she went out of her way to spend time with our cat, to reassure her and make her feel at home. Andrea is also very accommodating - our plane was delayed by a couple of hours, but we were still able to get back later in the evening and collect our cat with no stress, or fuss. Cats @ Ratcliffe is highly recommended and we plan to use them again, just as soon as we can book another holiday. 12/02/2016 J.A. This is a lovely cat hotel clean and friendly, highly recommended and Andrea is a lovely friendly owner, our cat Lucy was well cared for. 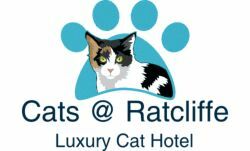 Cats @ Ratcliffe Luxury Cat Hotel is conveniently situated, within 25mins of East Midlands airport, 2mins from A610 and Junction 26 M1. We are also 2mins from Derbyshire borders, within 1 hour of the Peak district and Chatsworth.